Northwest Ohio Urgent Care Offers Licensed Medical Professionals Including Doctors, Nurses, and X-Ray Technicians Who are On-Site 7 Days a Week Treating Children and Adults. We Accept Most Major Insurances. Are you or a loved one seeking medical attention? Is it a non-life-threatening illness or injury? Visit us today at Northwest Ohio Urgent Care and avoid the long hours at the ER. Waiting in the ER can make the pain worse, and you will be waiting for hours. At Northwest Ohio Urgent Care we provide you with fast quality medical care. We are proudly open 7 days a week with extended hours. 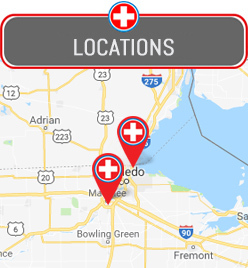 We currently have two locations, Maumee and Toledo. Not only do we see children, but we also see adults and seniors. Visit us today at any of our two locations in Maumee, and Toledo, OH. Let us help you feel better as soon as possible. If you need help with directions check out or directions page or call us for more details and questions.